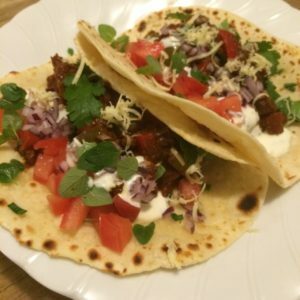 I cobbled together this recipe based on a dish I had in a good Mexican restaurant. It’s even better with homemade flour tortillas, the flour tortilla recipe is included below. Makes about 8-12 small tortillas and will easily serve 3 to 4 people. *You can use already ground spices. It makes it a lot faster and easier, but it is a bit harder to balance the flavours. The spices are tastier lightly toasted, and they are easier to toast whole. Optional fresh coriander and/or oregano. In a small frying pan gently toast the spices, they tend to make a popping noise once they are ready. Set them aside to cool. Add all herbs and spices to a food processor and process until you have a fine powder, the same effect can be achieved with a coffee grinder or with a mortar and pestle. Sift the spice mix through a coarse sieve to remove any large gritty pieces from the spice mix and set aside ready for use. I find the annatto seeds I buy are very tough and hard to grind. So I usually use a lot more as there will be a fair amount that won’t go through a sieve, these tooth hazards should be discarded. Heat a tablespoon of vegetable oil in a deep, heavy-based frying pan. Fry off onions until nearly transparent, then add chicken and fry lightly to seal it, turn down heat and add the spice mix, add the capsicums and mix to coat the chicken thoroughly, brown the chicken but the inside should not be cooked yet. Add about a quarter cup of stock and the tomato puree, try not to add too much liquid you need only enough to deglaze the pan and to allow the chicken to simmer and simmer gently for about 12 minutes. Add a splash of wine or tequila, and cook out the alcohol, top up sparingly with stock to prevent the mix from drying out completely, there should only be a minimal amount of liquid which will thicken to a gravy-like consistency. Prepare the condiments while the chicken is cooking. Add the broccoli and cauliflower To the and cook for a further 5 minutes or until the broccoli is cooked. Serve the Chicken in a separate bowl and assemble your fajitas by putting the desired amounts of each filling and folding to eat. A couple of teaspoons of oil for cooking the tortillas. Mix dry ingredients and oil together, this should result in a crumb-like mixture, pour in the warm milk and knead until smooth, place in a bowl covered with a damp cloth for 20 minutes, divide into small balls, 8 for big tortillas or up to sixteen for smaller ones, I prefer smaller tortillas, Leave the portioned dough to rest under plastic wrap for a further ten minutes. Roll into 3mm thick circles, small ones should be about 15-20cm wide, dust lightly with flour to prevent them sticking to each other and set aside under a plastic wrap until you are ready to cook them. cook one by one, take a flattened Tortilla. Cook on a medium-high heat in a lightly oiled heavy-based frying pan until it puffs up a little and is toasted lightly on both sides. Cook for about 1 minute each side, slightly less on the second side. Be careful not to overcook or they will become crunchy. They need to be properly cooked, but still soft and able to be folded. They should be mostly light coloured and flexible with dark toasted spots where the bread bubbles during cooking. The tortillas will sometimes blow up like pillows, just gently push most of the air out and turn over to cook the other side.